The Sweet Shrub Plant, a wonderful addition to any garden, grows well in neutral to mildly acidic soils in zones 5 to 9. Its reddish-brown to dark maroon flowers are up to 2 inches in diameter and have a strong, sweet and fruity scent. Its dark green leaves are slightly rough to the touch and have a clove-like scent. It is an exceptionally easy-to-grow deciduous shrub that blooms in mid-April to mid-May. Reaching a mature height of six to nine feet, this slow to medium growing shrub grows 12 to 24 inches in a year. The Sweet Shrub makes a wonderful foundation planting or background for smaller plants. Sweet Shrub Plant is short. Sweet shrub is an aromatic flower native to the North American east coast, from Pennsylvania to Florida, and the Appalachian region. Known by many familiar names, such as strawberry-bush, spice bush, Carolina allspice, and sweet Betsy, this sweet plant inspires warmth and comfort in the hearts of Americans with its delicate, scented spring-time bloom. Sweet shrub flowers bloom between April and May and are described as having a mouth-watering, fruity aroma akin to a variety of tropical fruits. The shrub can grow between three to six feet with a width as large as 12 feet. Its aromatic nature makes it an ideal plant to place along doorways or entrances as a welcoming scent to welcome guests with. The blooms are abundant and rich in color. The full, wine-colored flowers open to about one to two inches in diameter and are often collected for centerpieces and dried for natural potpourri. 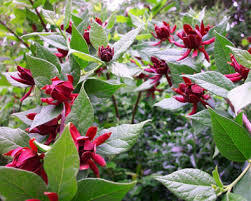 Sweet Shrub is known for its fragrant aroma. The blooms on the sweet shrub will let off a vibrant aroma when the leaves are bent, bruised or crushed. This shrub will only grow to around 10 feet tall and has a canopy spread of 4 to 10 feet as well. This plant loves loamy soils. The leaves are dark green and will turn a golden yellow in the fall. The flowers will become a vibrant, dark red in the winter months so with this shrub you will have lots of colors all year round. This plant can be planted in the ground or planters around a patio, deck or home.